Great observation! Regarding the humanness of it all, you’re spot-on. But there’s a “not exactly” lurking about that we need to address. Generally speaking, transference is a phenomenon characterized by unconscious redirection of feelings from one person to another. We all do it. But for our immediate purposes, we’re talking client to therapist. The inappropriate repetition in the present of a relationship that was important in childhood. A redirection of feelings and desires, especially those unconsciously retained from childhood, toward a new object. A reproduction of emotions relating to repressed experiences (especially from childhood), and the substitution of another person for the original object of the repressed impulses. Do you know who first described transference? It was the founder of psychoanalytic theory himself, Sigmund Freud. Initially, Freud believed transference was nothing more than a barrier to his work with a “patient.” But he came to understand it was, in fact, the very essence of the work. Think about it. How could a therapist hope to understand his client without coming to grips with the dynamics of transference? 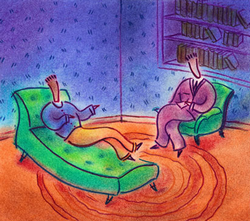 So in psychoanalytic therapy – in my opinion, any form of psychotherapy – a key component of the work is the therapist and patient gaining insight into the transference relationship. And then it’s on to working through the underlying dynamics. What exactly is conveyed in transference? Hmmm, all sorts of stuff – mistrust, hatred, rage, eroticism, love, dependence, deification, parentification – and then some. Lot’s of humanness, don’t you think? Well, don’t for a moment think that all of this transference biz is a client-to-therapist exclusive. Nope, therapists often unconsciously convey their feelings and thoughts in the therapeutic exchange. Countertransference is a redirection of a therapist’s feelings toward the client. It’s been described as a therapist’s “emotional entanglement” with a client. Yes, we therapists are human! Can you see why it’s crucial for a therapist to understand the dynamics of countertransference? For the aware and insightful therapist, gaining insight into countertransference helps in the regulation of her emotions throughout the therapeutic exchange and relationship. And it can also serve as a window into what a client is attempting to elicit from her. How ’bout an example? Let’s say a therapist finds her client sexually attractive. If the therapist doesn’t understand that countertransference is at work – and its power – two people are going to get hurt. Assuming the therapist was wise enough to pick up on it, it’s on to exploring whether or not the client is actually eliciting the reaction. If, in fact, that’s true, the therapist may want to delicately inquire as to the client’s feelings toward her. And quality exploratory work pertaining to how those feelings relate to the client’s unconscious motivations, desires, and fears can ensue. Of course, the therapist better be motivated to ponder her issues – and how they’re coming into play. The therapist has to be able to distinguish between what her reactions to the client are telling her about the client’s psychology, and what they’re expressing about her own. So there you have it – the scoop on two therapy-important morsels of psychobabble. I believe the more you know about the dynamics of therapy, the greater your chances of enjoying positive outcomes. Transference and countertransference are fascinating phenomena. Watch for them! And the next time you’re in session, talk about them with your therapist. The learning opportunity is great. Would you like to read more chipur articles on the psychology of depression, anxiety, and bipolar disorder? Well, click right here. Previous Post: Transcendental Meditation: For Your Depression & Anxiety?